It was nearly a year ago that I first realized I had accumulated four ST submarine simulations in my library. And, it being the middle of a long, hot and lazy summer, it seemed like a good idea to scope out the quartet and present them to you side-by-side, so that you might better spend your all-too-limited software dollar. It seemed like a good enough idea at the time. However, once I started working on them, the project began to take on a frightening life of its own, and I felt overwhelmed by the sheer enormity of my endeavor. But once I stepped back and got a grip on myself, I realized that in reality the simulations were really very similar, both in objective and execution. Predictably enough, each puts you in command of a submarine. All, with the exception of Red October, simulate submarine tactics of WWII. Each has an icon-driven interface that makes the issuance of orders easy. In fact, as is usually the case with well-designed simulations, it is the learning of the game, rather than the playing of it that is difficult. Fortunately, full utilization of the powerful windowing and menu features of the ST simplified even this complex task. Other features present in each were the standard save-game routines and some method to compress time to some degree to speed play. Each also had a fine manual. Suffice it to say that all are good programs, delivering more than their money's worth. So, to avoid any subliminal suggestion of superiority at the outset, I'll encapsulate them now in alphabetical order. As I found with all these games, Gato is an easy-to-learn and easy-to-play simulation. Upon booting you choose a torpedo-to-mine ratio, which determines your allocation of armaments. Other game settings are accessed via a pulldown menu, and you can control the general level of difficulty, as well as adjust some of the characteristics of enemy ships (speed and aggressiveness) and of your sub (speed, rate of resource consumption and hull strength). All of these can also be changed during play, although the general level of play cannot be varied during enemy engagement. The screen itself follows the general scheme used in each of these games. The bulk of the display contains your view out the periscope. 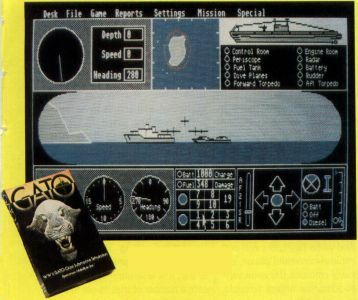 The top of the screen is consumed by radar, damage control area, map area and digital readouts displaying speed, heading and depth. These readouts are duplicated by the gauges at the bottom of the screen. The display also contains the arrow-shaped icons you will use to control movement of the sub and its periscope. Fuel and oxygen indicators, as well as torpedo control, also line the base of the display. Upon selecting a new mission, you receive a message that sends you on your way. The 20 missions follow one of three patterns: a rescue, a mining job or search-and-destroy mission. Optional mission disks promise additional assignments, as well as a facility to create your own scenarios. Play is simple and intuitive, although I had to go to the manual to determine how to do a couple of things, like switch between the patrol area map and the more enlarged quadrant map. The manual itself is well-designed and concise—more an index to the game's features than a treatise on submarines—and is supplemented by a nice section on strategy and tactics. A nice program.